Wes Miller, Head Coach of UNCG Men’s Basketball has coached and played with some amazing athletes and players. He’s got another great one: Isaiah Miller. Miller is creating his own version of “A Star is Born” right here in Greensboro, NC. Coach Wes Miller on Isaiah after their win at Elon…..
Isaiah Miller isn’t just energy personified, he’s a 6 foot dynamic player that leaps off the screen. And that’s not an analogy, Isaiah has a 47 inch verital leap, his ferocious athleticism, and out right fearlessness around the rim has gotten him nicknames like, “Young Westbrook” or “Jumpin Jack Flash”. I’ve even penned my own, “#AllDayZay”. 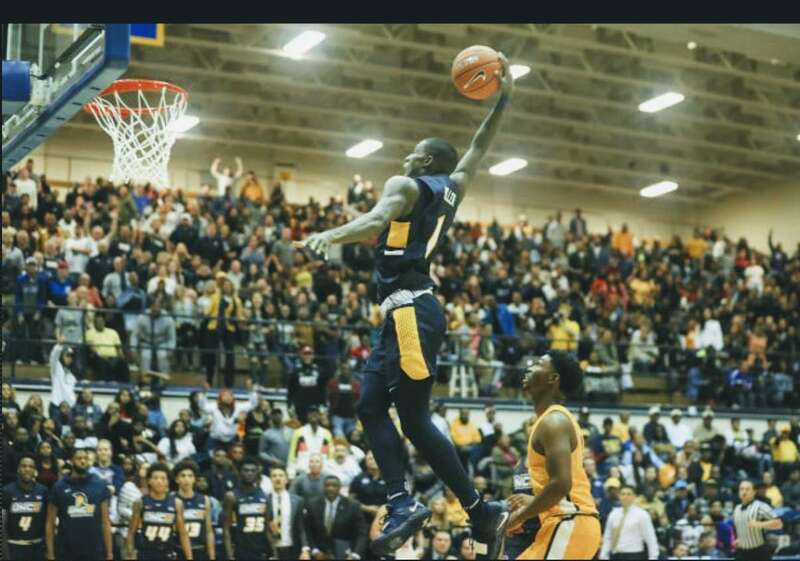 For those who haven’t caught a UNCG game this season, make sure you have your Instagram, Facebook, Twitter and Snapchat stories ready, because when this young man gets into the open court he’s every bit as good a dunker as Zion Williamson. Yes I said it. That man Zion , who every time he dunks, you get an ESPN alert. Well trust me when I tell you, Isaiah Miller is a show all to himself. Lift off came in the first game of the season at NC A&T. Against the cross town rival Aggies, Miller had 16 points 4 rebounds and 4 steals. But it was his Sportscenter Top 10 play that sealed the game for the Spartans. Isaiah crossed over his defender, drove the lane, leaped, cocked back his right arm and flushed it home. The reverberations were felt all through Greensboro. The home court fans started to file out buzzing about Isaiah Miller, aka Young Westbrook, aka jumpin Jack Flash, aka #AllDayZay. That shows up on every possession for the sophomore guard. Miller plays each second like it’s his last, almost as if someone told him “today is the last day you’ll play basketball, make the most of it.” Ben Miller thinks it’s Isaiah’s strong faith in God, and his want for everyone around him to be happy and prosper as the keys to his success, as a player and more importantly as a man. Hard work has paid off for the Spartan guard. So far, in the first 3 Southern Conference games, Isaiah is averaging 19.3 points, 6.3 rebounds, 3.6 steals and 2 assists a contest. He’s also shooting a whopping 58.9 percent from the floor and 40 percent from 3 point land. As UNCG faces their two toughest Southern Conference opponents to date, Wofford Thursday and Furman Saturday, most pundits and previews have been talking about the importance of Francis Alonso, James Dickey and the likes of Fletcher Magee. All are very true assessments, but it’s the emergence of Isaiah Miller that has Spartan Nation buzzing, waiting for that breakaway dunk moment, or a chase down block. Lurking this weekend at the Greensboro Coliseum, first Thursday, against Wofford and, Saturday against Furman, the best kept secret in the Southern Conference will be UNLEASHED, don’t blink.